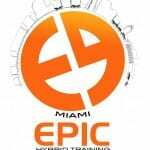 EPIC Hybrid Training is a total body training program that helps people of any fitness level tap into their inner athlete. We start with a foundation of functional body weight and strength training, toss in a hefty dose of High Intensity Interval Training (HIIT) and top it off with some mobility drills to recover and restore your body. Each of our locations showcase monkey bar traverses (with varying difficulties), ring and rope traverses, wall traverse, salmon ladders, rope climbs, wreckbag, kettlebell training and more. Our semi-private classes offer you a different workout each day of the week including our EPIC Obstacle Circuit (EOC), The Grynd and Blast. Dubbed, “the toughest workout in New York City” EPIC is more than just a gym, it’s an experience!